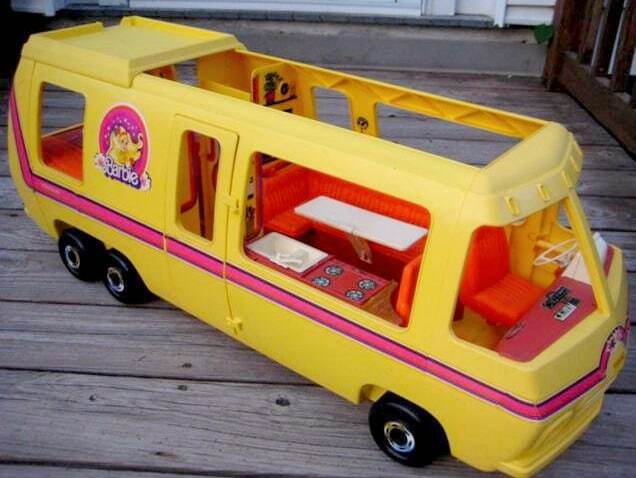 I wanted that Barbie Dream Camper more than I ever wanted anything. You see, it wasn’t just a camper, it was the ultimate in luxury and style – on wheels. It even had a shower. My own family’s camper didn’t even have a shower! This camper was cutting edge modern technology, I tell you. I just prayed that Santa thought I been good enough to deserve it. It was the Christmas of 1977 and I was 8 years old. As a kid, I loved everything about Christmas; the decorations, the gifts, the snow, the family gatherings, the whole spirit of it all and most notably, the endless array of amazing food! We are talking about some special food here, food that only came out at Christmas; food that was otherwise forbidden. But it was the butter tarts I yearned for; my grandma’s butter tarts. Butter Tarts symbolize Christmas not only for me, but for many Canadians. They are the quintessential Canadian comfort food. But I love butter tarts so much that I needed more butter tart flavoured food than actually existed. And that’s why I created this Butter Tart Swirl Bundt Cake with Brown Butter Maple Glaze. I don’t think I was a particularly materialistic kid, no more so than other kids, anyway. But that Christmas, the butter tarts alone were not enough to satiate me, I wanted that Barbie Dream Camper so bad I could taste it! Not only did I LOVE Christmas as a kid, I couldn’t wait for Christmas! Leading up to the big event, the excitement was just oh too much for me to handle. I couldn’t sleep and was out of bed constantly, trying to get my family up, starting at about 3 AM. In fact, I was exactly like Martin Short’s SCTV character, Ed Grimley in “The Fella Who Couldn’t Wait for Christmas”. If you’ve never seen the skit, check it out below – it’s hilarious! But that Christmas eve was more excruciating than any other. I was so beside myself with excitement that I stayed up practically all night. Would that camper be under the tree when I woke up? But when I got up that Christmas morning to find a Christmas Tree completely void of a Barbie camper, I was devastated. What had I done to displease Santa so much that he’d withhold the gift; the gift I wanted more than anything in the world?! Fortunately, I could drown my sorrows in the butter tarts. In retrospect, not getting what you want (even from Santa) isn’t necessarily a bad thing. It definitely prepared me for the rest of my life and taught me that sometimes, not getting what you want has nothing to do with whether or not you deserve it. This knowledge would also serve me well for the next 40 years. And not surprisingly, it’s not the gifts that have endured all those Christmases; it’s the butter tarts, along with the life lessons, of course. When I moved away from home and spent my first Christmas away from my family, it was the butter tarts that gave me the comfort that no gift could possibly provide. One bite and I was transported back to those joyful Christmases past. Now I make my Grandma’s butter tarts every Christmas. You can find the recipe here: Best Ever Butter Tarts. And as I noted, my love for butter tarts knows no bounds- that’s why I also created a Butter Tart Thumbprint cookie. 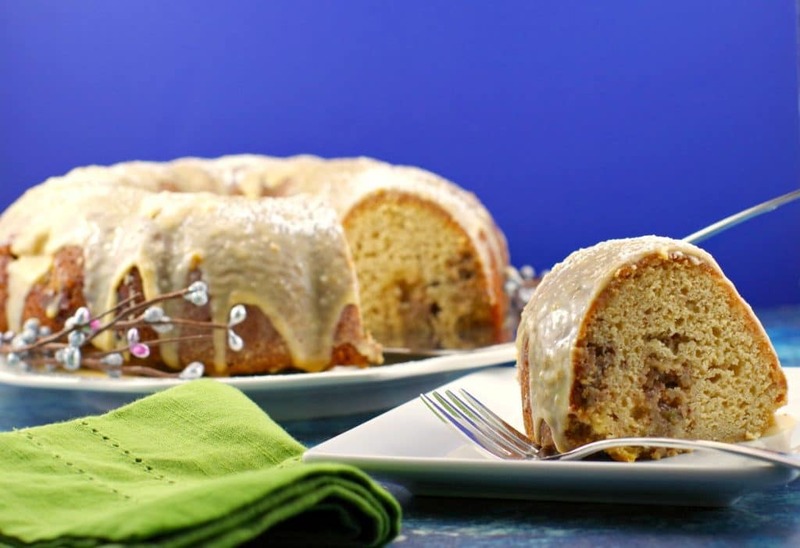 And now, this delicious Butter Tart Bundt Cake has been added to the butter tart family. 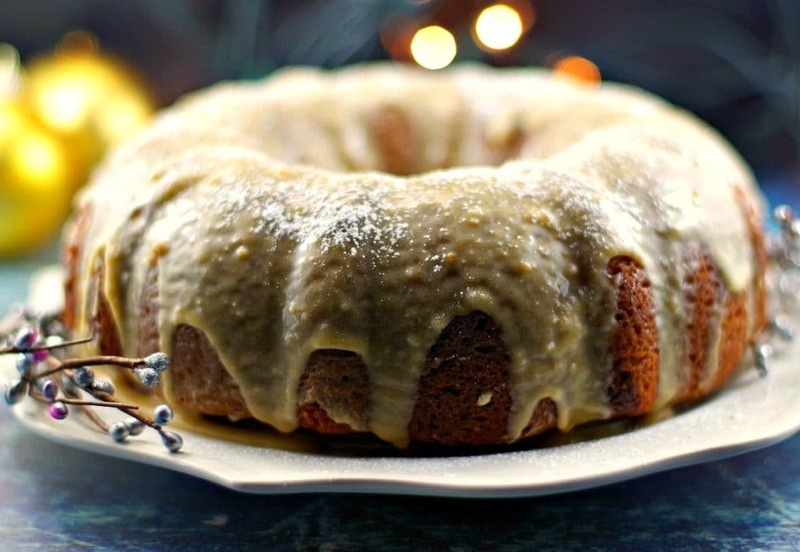 These bundt cake pans will serve you well for many years to come! Butter Tart filling is swirled into this delicious butter tart cake, then it's smothered in a creamy brown butter maple glaze. A delicious butter tart in the form of a cake! The perfect dessert for your Christmas dinner! 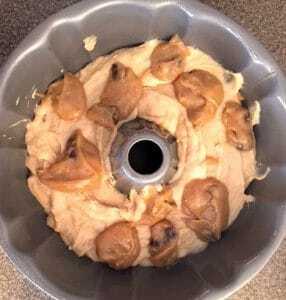 Grease bundt cake pan with non- stick cooking spray. Preheat oven to 325 degrees F.
In a medium pot on stove top, add 1 tsp vanilla to ¼ cup and 2 Tblsp whipping cream, heat to medium low, then add 2 Tblsp and 2 tsp butter. In a separate bowl, combine 3 eggs, and 1 1/2 cups brown sugar. 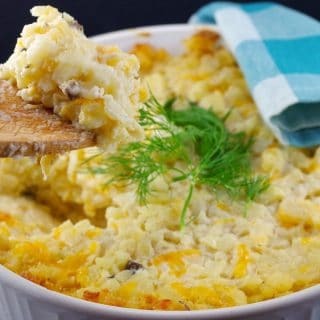 Add egg mixture to warm cream mixture and simmer on low, then add 1 ½ tsp vinegar and whisk in 2 tsp of cornstarch. Add ½ cup raisins or chopped pecans. Keep whisking until thickened on med/ low heat for about 12 -15minutes. Filling will be consistency of thick gravy or pudding. Remove from heat and cool. Pour 1 tsp vinegar into 1 cup milk (let stand ) Mix 2 ½ cups flour and ½ tsp baking powder together – set aside. Cream 1 cup unsalted butter and 2 cups brown sugar with electric mixer, then beat in 1 tsp each butter and vanilla extracts, 2 eggs and ¼ cup whipping cream. Mix dry ingredients into wet and stir until combined. Mix 1 tsp baking soda into milk mixed with vinegar, stir and allow a moment for it to bubble up. Then fold into cake mix and stir until just combined. Pour ½ the cake batter into the bundt cake pan. 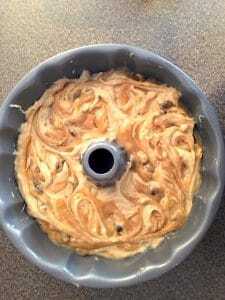 Drop spoonfuls of the butter tart swirl filling (about ½ of the filling) over cake and swirl gently with a knife. Pour in remaining batter and swirl in the remaining butter tart swirl filling, using the same technique. Bake in preheated oven for approximately 1 hour or until cake tester/toothpick comes out clean. Cool on wire rack. Remove from heat and add 1 tsp maple extract then cool to room temperature. Whisk the butter mixture with 1 cup confectioners sugar and add 3 Tblsp of whipping cream. Pour Brown butter maple glaze over cake and allow to harden a few minutes. You had me at butter tart – I am very intrigued by the title of your post. 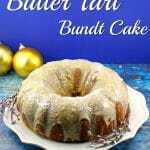 I will definitely be trying this Butter Tart Bundt Cake over the holiday for my family and friends. It looks irresistible! Thanks for the inspiration, Terri! Hi Denise: I really hope you enjoy it! I brought it to a work potluck (we were supposed to bring a dish that symbolized Christmas for us) and it was well-loved! What a neat idea to have a favourite treat in bundt cake form! 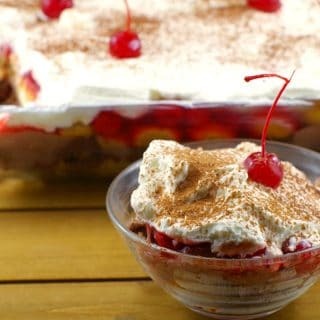 This one would be perfect to serve at holiday get togethers! That glaze looks delish! Thanks, Charlotte! I only got my first bundt pan a few years ago too – changed my life :)! I hope you enjoy the cake and it satisfies that true Canadian butter tart and maple craving. I love butter tarts! This will be great. I hope you like the cake, Charlotte!